Tents bring colour to “The Meadow” and some pitches provide views down the valley and out to sea. Our tent pitches are spacious, immaculately presented and maintained, providing a generous area for your car and outdoor dining area. We offer the choice of either an electric or non-electric hook up pitch. All tent pitches have water taps close by. 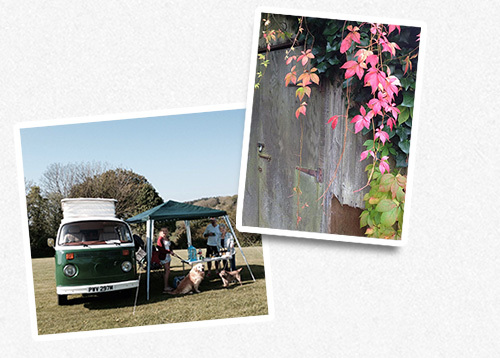 The campsite has been developed over the decades to make Salcombe Regis a camper’s haven appreciated by generations of families. Superb pitches, some with stunning views and the coast path a short walk from the Meadow, which then leads down to the beach on which to relax. The often-clear sea makes an ideal environment whether you are fishing, swimming, or just unwinding. Play areas for the children, relaxation for adults and security for all. The excellent on-site amenities make your holiday complete. Completed in 2017 is a new amenity block in the Meadow. The block comprise one family shower room (with Part M disabled access), 2 private shower washrooms, 4 private WC rooms (WC & Sink) and two dishwashing sinks. This block is unisex but separate male/female services are still available in our main utilities block. We are part way through the construction of our new reception facility and unfortunately it will not be completed this season but it will be well worth waiting for in 2019.